Heat oven to 350°F. Place paper baking cup in each of 24 regular-size muffin cups. Make, bake and cool cake mix as directed on box for cupcakes, using water, oil and eggs, and adding cinnamon and vanilla. In medium bowl, beat butter and powdered sugar with electric mixer on medium-low speed until combined. Gradually beat in milk and maple extract on medium speed until fluffy. 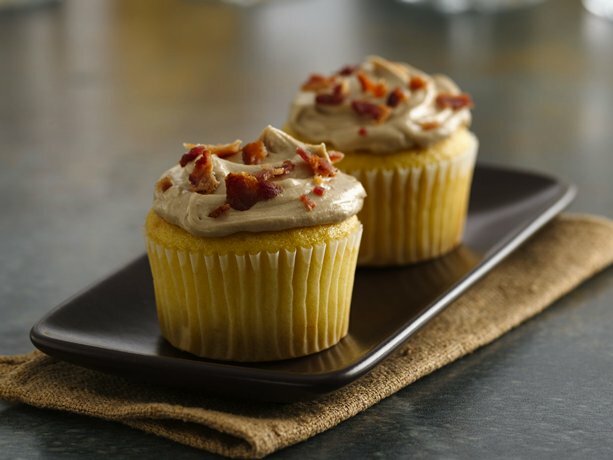 Pipe or spread frosting on cooled cupcakes. Sprinkle tops with bacon.